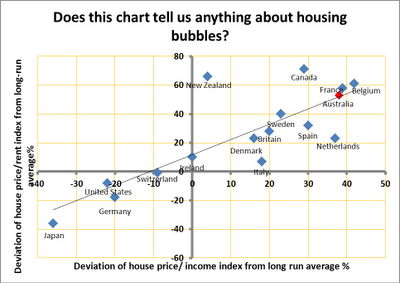 Freedom and Flourishing: Is there a house price bubble in Australia? An article in ‘The Economist’ last week suggests that the ‘bursting of the global housing bubble is only halfway through’ (‘Economics focus: House of horrors, part 2’, November 26, 2011). 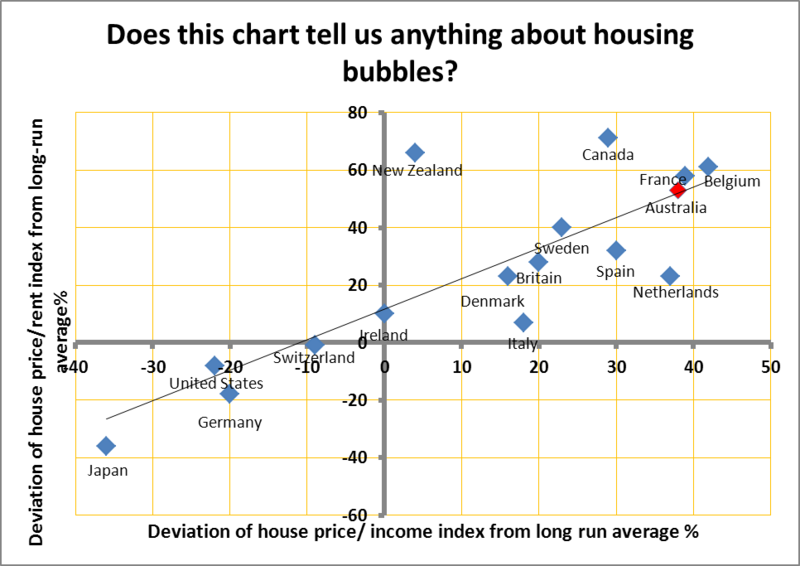 On the basis of the measures used, the authors claim that home prices are over-valued by 25% or more in Australia, Belgium, Canada, France, New Zealand, Britain, the Netherlands, Spain and Sweden. How did the authors arrive at this conclusion? Two measures of valuation were used in the analysis: the house price to income ratio, which is a gauge of affordability; and the house price to rent ratio, which reflects the relationship between house prices and the benefits of home ownership i.e. rents earned by property investors and rents saved by owner-occupiers. The reasoning seems OK so far. If the price to income ratio is above an appropriate benchmark of affordability and the price to rent ratio is relatively high compared with an appropriate benchmark of returns available from owning other assets, then there might possibly be some grounds to suspect the existence of a housing bubble. The critical issue is what benchmark should be used to make such comparisons. ‘The Economist’ asserts: ‘if both of these measures are well above their long-term averages, which we have calculated since 1975 for most countries, this could signal that property is overvalued’. In the chart below I have graphed the data from the table that the authors use to make their assessment. The chart shows that the price to income and price to rent ratios for a heap of countries, including Australia, are well above long-term averages for the period from 1975 to the present. I think mean reversion (sometimes referred to as regression to the mean) deserves some respect. If we don’t have good reasons to expect a variable to remain substantially above or below its long term average at a particular point, it is often sensible to assume that deviation from the mean is more or less random and that the variable is more likely to return to the mean than to remain at extreme levels. So, do we have good reasons to expect rental yields (the inverse of the house price to rent ratio) in Australia to remain below their long term average for the period since 1975? In order to answer this question it might be helpful to consider the level of rental yields in Australia at present and how much capital appreciation (expected growth in house prices) is implicit in current rental yields. The underlying reasoning is that if potential home buyers – including investors - perceive that there is likely to be substantial capital gain in the years ahead they will tend to bid up house prices to a greater extent (other things being equal) and thus tend to depress rental yields. You need to work out how much capital appreciation they anticipate in order to assess whether or not their expectations are excessively optimistic. Current rental yields in Australia - of the order of 3% to 4% in net terms – do not seem to me to imply unduly optimistic expectations about future capital appreciation if we use an annual nominal return on investment of say 8% per annum as a benchmark. One way of looking at this is to ask yourself whether you would expect average house prices and rentals to grow more or less rapidly than nominal GDP. I expect average house prices and rentals to grow more rapidly than nominal GDP in Australia because the effects of growth of population and incomes will tend to intensify the locational advantages of the median house relative to houses in the outer suburbs. A recently published Reserve Bank research discussion paper by Mariano Kulish, Anthony Richards and Christian Gillitzer (‘Urban Structure and Housing Prices: Some Evidence from Australian Cities’) uses a model to illustrate, among other things, how growth in population tends to raise house and land prices to a greater extent in suburbs that are closer to the CBD of large cities. This is consistent with the empirical evidence presented in the paper that house prices in the inner suburbs in Australia rose by about 1.3% more per annum more than in the outer suburbs over the period 1992/3 to 2009/10. Why are rental yields in Australia currently so much lower than the long term average over the period since 1975? The most plausible reason, it seems to me, is that as in many other countries high nominal interest rates (reflecting high inflation rates) were suppressing demand for housing over the first half of that period. As inflation rates and interest rates came down, housing affordability improved markedly during the 1990s, but this led to increased demand for housing, a sharp rise in house prices and a decline in rental yields. Mean reversion doesn’t apply in this instance because the mean was distorted. Why should we expect house prices in Australia to avoid the fate of house prices in the US in recent years? Luci Ellis of the Reserve Bank gave some reasons why the US housing market is different in a speech she made last year. Unlike other developed countries, mortgage arrears on home loans in the US started to rise in 2006, more than a year before the unemployment rate began to rise. The leverage of the housing stock in the US was substantially higher than in Australia before the global financial crisis. In addition, the decline in housing prices in the US that resulted from the bursting of the housing credit bubble was exacerbated by deflationary monetary policies that led to a major recession. This suggests to me that current rental yields in the US (of the order of 8% to 12% in some areas) should be viewed as being extraordinarily high at present and unlikely to persist in the longer term. The final sentence of the article in ‘The Economist’ states: ‘A credit crunch or recession could cause house prices to tumble in many more countries’. Well yes, that does seem quite possible. If it does happen, however, I think there is a good chance that rental yields in Australia will eventually return to somewhere near the ‘normal’ levels that currently exist in this country.